How Online Review Sites like TripAdvisor, Yelp can Hurt your Travel Business? 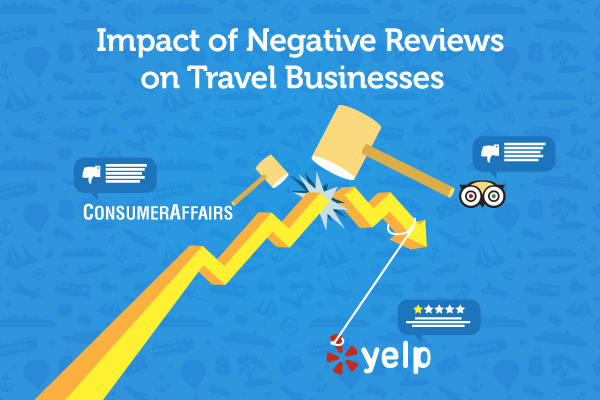 While user reviews & recommendations are the biggest source of revenue for travel businesses, sites like Yelp, TripAdvisor, consumeraffairs remain the biggest threats. That’s chiefly due to their high-ranking-ability in Google search results and furthermore the users’ tendency to rely upon negative reviews while making their travel bookings. All travel & hospitality businesses are searched through top review sites before user decides to pre-book for an excursion. So, it’s nearly impossible for a hotel, restaurant, airline, travel websites, agents or cruises to ignore the risks attached to online ratings & feedbacks posted by a past customer. It’s unfeasible to calculate how many potential customers you lose due to negative reputation but the damage is certain. New people who search for local travel agents, booking websites in Google, Yahoo, Bing or social media sites for that matter never try a brand that has negative review online. Word of mouth can be the biggest source of leads in travel business and the same can counterattack if it describes you negatively. Negative reviews harm brand image and add negative perception about a brand. These reviews don’t just take away new users but also impact the old clientele since it’s tough for them to trust a seller more than fellow users. Negative results for business/brand name search are most hazardous as they send away unique traffic, lead to negative reputation & hurt brand identity. 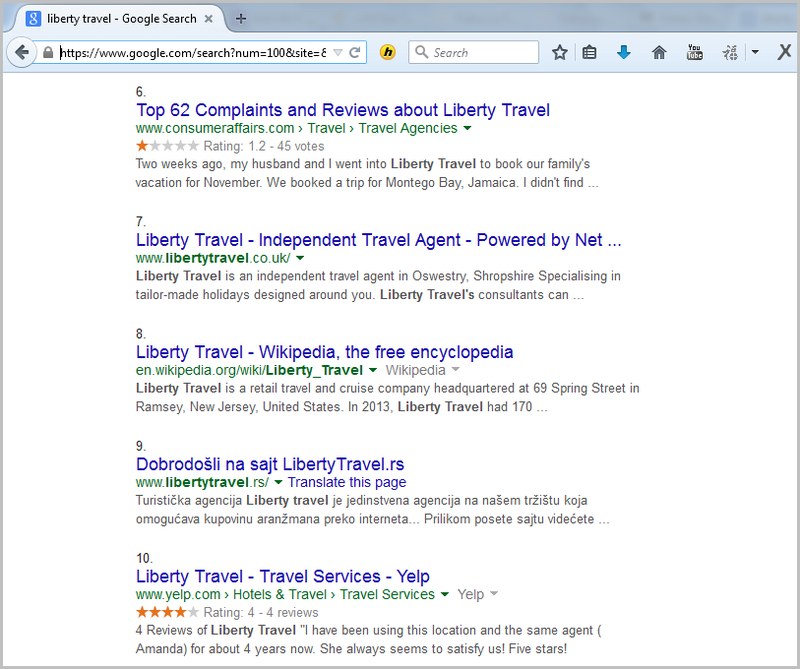 Liberty Travel, an international travel company faces the similar trouble in Google searches for its brand name. Its negative reviews on Yelp, Consumeraffairs and other sites appear in Google results for ‘liberty travel’ term, which is apparently causing damage to its brand identity. Brand image is most essential for travel companies as it involves services and people are more vigilant before booking a hotel. To judge a travel service provider people hugely rely on feedback from other customers as that’s the only way (seemingly reliable) to judge before taking services. Therefore good or bad reputation among target users who are hypothetically the potential travelers matters a lot to generate traffic and sales in future. If a new user searches for a hotel/cruise in Google and comes across top ranking negative reviews for that business, he/she is most likely to look for another hotel/cruise service provider. 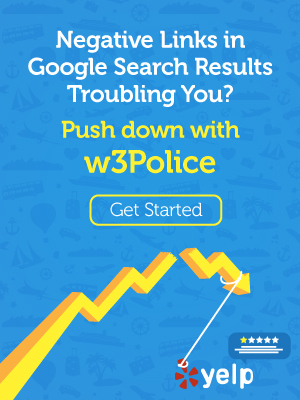 Are you in trouble due to Negative Links in Google Search Results? Responding to negative reviews proves lethal as it paves way for destructive thread where more negative comments get lined in. More visibility of negative results adds to their authority. Volatility of user-generated content due to which controlling negative threads on sites like TripAdvisor or Yelp is nearly impossible. Businesses have no control over how the reviews appear. The results keep fluctuating and take some time to get pushed down to farthest rankings. The reviews are socially sharable and so carry the obvious risk of spreading across web like fire. Customarily, almost 66% users are influenced by user feedbacks so you cannot think of getting away of Yelp, TripAdvisor or any other review site. All you can do to fight the aftereffects of negative reviews is to start working on damage repair as per search engine norms. It’s tough to define exactly how much time it may take to get your clean image back but with effective reputation management, you can expect to bring down the loss. Invest in content marketing and offer content that is useful for your target audience. 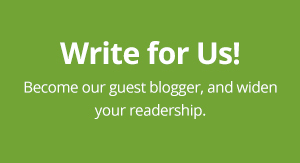 Add customer reviews to your own website. Ask for reviews on your social pages from existing & satisfied customers. Promote your social media profiles strategically to build user engagement and propagate authority. Make your brand likeable by sharing visually appealing media like good quality videos, images and multimedia content. Use Search engine optimization and paid strategy to attract more traffic. There are several ways to treat negative reviews but to attain results within a desired timeframe demands strategic & consistent approach supported by thorough analysis. Contact ORM professionals to learn more about the right ways to deal with negative reviews of Yelp, TripAdvisor & similar sites from. Posted in Travel Reputation Management and tagged as liberty travel reviews, negative reviews on tripadvisor, online reputation management hospitality, online travel companies reviews, travel companies reviews, travel industry online marketing, Travel Industry Reputation Management Solutions, tripadvisor reputation management, tripadvisor review management, yelp reputation management service by w3Police.